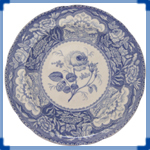 This pattern is seen here on an indented earthenware dinner plate printed in blue underglaze. 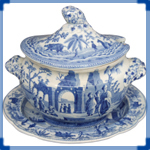 Designed after a Chinese pattern from the K'ang Hsi period, 1700-22, it was introduced by Spode c. 1815. In the early 1800s the name "India" was often used to describe an oriental style. This pattern is also found in a multi-colored enmaled form, an example of which is also included in this exhibit. 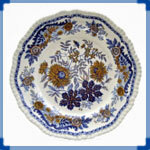 The earliest known design like this has pattern number 2489 first recorded in 1816. It is thought that India was withdrawn around 1835. Specimens of the India pattern have been found with the inscription This BLUE WARE is printed from the CALX of British COBALT reproduced from Sparnon Mine in the County of Cornwall August 1816. This example bears that mark. (See Transfer Printed Mark 65a). The mine was near Redruth in Cornwall, and the vein of cobalt was discovered there in 1807. It was later widely used by the Staffordshire potters.